BREAD & FILLINGS: Chicken, lemon and tarragon on granary; ham, celeriac remoulade and tomato chutney on onion bread; smoked salmon on brown; egg mayo on white; cucumber on white. PROS: Claridge’s is like some kind of ultimate pleasure palais; once you’re in, it feels like time could cease to mean anything at all and you’ll emerge three weeks later having spent a million pounds and destroyed all your organs. I like that. The light also has a disorientating green hue to it, as if you’re looking through absinthe goggles. This afternoon tea has to be the most perfectly executed in London, surely. The room is as grand as they come and looks like it was jointly designed by the Queen and the Mad Hatter. The sandwiches arrive on that distinctive stripy china, and they keep on arriving until you stop asking for more. In my case, that was after the third round. I know. You knew I liked sandwiches though, right? 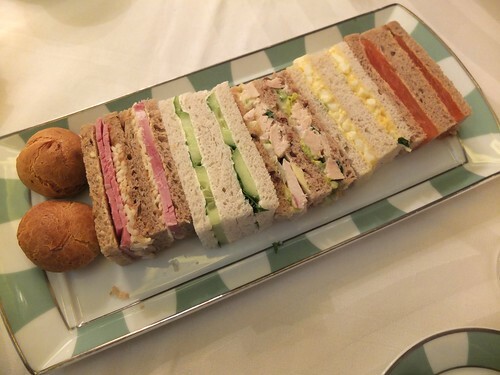 Tea sandwiches are so appealing because of their dainty size, and the fact they can be consumed in a few bites. It doesn’t feel like you’re stuffing yourself (until the third round) and you never get bored before moving onto the next filling. These are exemplary. The egg mayo is proper nursery food stylee, as it damn well should be; it’s one of the greatest and most comforting fillings of all time and I will not hear otherwise. The smoked salmon is of first class quality (Severn and Wye), and plentiful. The ham is Dorrington, and comes with celeriac remoulade, which I love, and tomato chutney, which I would usually hate because I hate all chutney. Why has no-one realised that chutney tastes horrible? Weird. They somehow make it work; there’s just background sweetness rather than any taste of – boke – chutney. The chicken is Daylesford organic and therefore has actual chicken flavour, helped along by being at the right temperature; it’s sad that we now so often associate chicken sandwiches with too-cold pappy pre-packs. The cucumber numbers are perfect too, crisp as you like. Such an under-rated filling. Oh, and the best thing about all of them? So bloody British. I took the cakes home. PRICE: £20 including chips and a side salad. 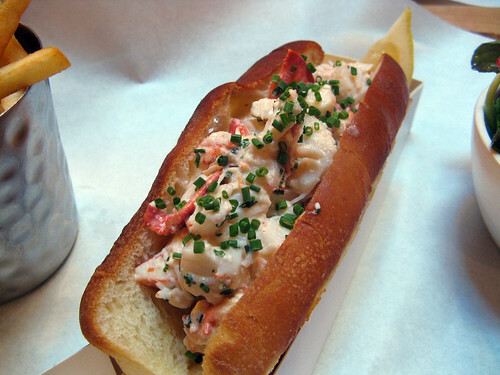 FILLING: Lobster meat bound with mayo, sprinkled with chives. PROS: Everything about this sandwich is perfect. It brims with big chunks of tender, sweet lobster meat; the perspective on the photo doesn’t do justice to the generosity of filling. I was worried there might be too much mayo but no, just enough to bind everything together and lubricate. Perfectly judged. As much as I enjoy working over a lobster, there’s a lot to be said for having it all there, ready and waiting to be stuffed in my face. The bread is absolutely incredible too, the butteriest brioche I’ve ever tasted; the texture impossibly light and fluffy within, crisp and toasted on the outside, the butter in the bread leaving it caramelised. 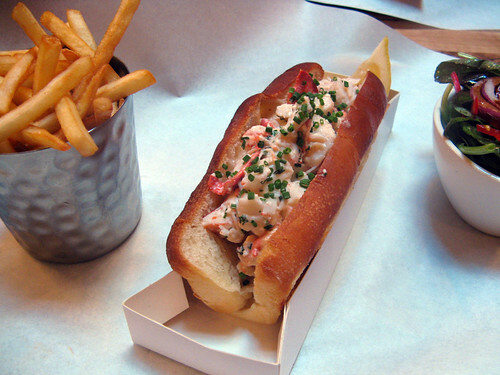 Bite after bite of that stunning, rich brioche and that decadent lobster meat, the subtle oniony tingle of chives. Heavenly. I ate half then made sure to finish my chips and salad before polishing off the rest; an experience to be savoured and repeated, often. CONS: None. The first ever perfect 10 on LROS. I knew as soon as I took the first bite.